I have recalled, for many years, attending one particular Saturday evening of racing at Fonda Speedway, on the Montgomery County fairgrounds. My uncle and I had seen a number of spectacular wrecks due to the high speeds achieved by the NASCAR sportsman cars and to the irregular layout of that track. We had sat through Shoemaker’s 111 burning to the ground and Ken Meahl flying over 30 feet through the air in Red Snediker’s 28NY. That May program seemed to be snake bitten from the start. The qualifying results included some unsual winners that night, and some of that was because of the accidents that happened in two of the three heats. The one that sticks in the mind the most was the wreck of Jim Hoyt, a driver from Saranac Lake with whom nobody was very familiar. I also remember seeing a photo of Hoyt’s wrecked car, the following week, in a national racing paper. Too bad, no one can now find that photo anywhere. In 2005, when I began attending races at Airborne Speedway – after an absence from racing of 18 years, one of the men whose acquaintance I made was Jim Hoyt. The accident has been discussed in detail many times since. FONDA – Bill Wimble of Lisbon, the defending track champion, cashed in his first win of the season when he captured the 25 – lap NASCAR headliner of an accident – studded stock car racing program of the Fonda Speedway. Bill Wimble was in the hottest period of his career in the early half of the ‘60’s. Wimble grabbed the lead on the 25th lap in the third turn in an exciting finish that saw the Fonda fans on their feet and screaming. 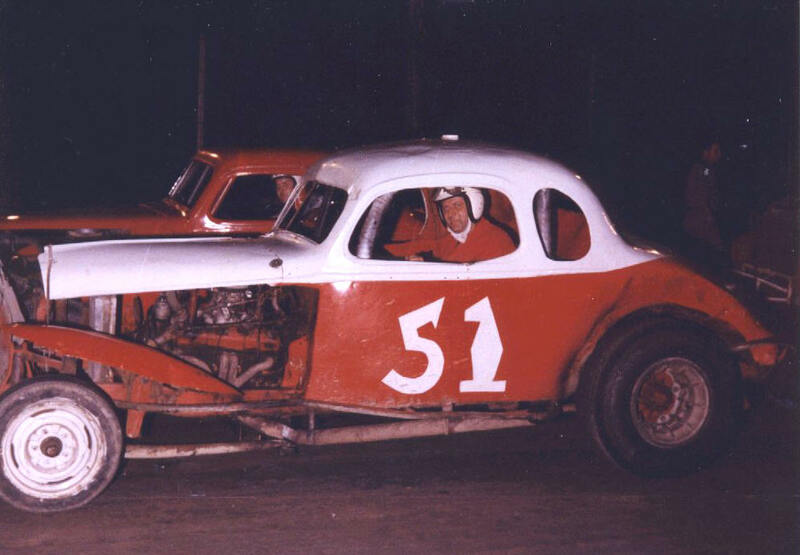 Wimble, former NASCAR National Sportsman Champion, overtook Paul Marshall of Schenectady on the final trip after Marshall had set the pace for the first 24 laps. Wimble went under the wire with less than a car length to spare. flying at Fonda in 1964. Steve Danish of Cropseyville finished behind runnerup Marshall, and Lou Lazarro of Utica was fourth. Ernie Gahan, of Dover NH, took fifth. Jimmy Hoyt has recalled a lot about the snazzy red, three – window coupe he took down to Fonda, accompanies by friend, Wes “Slugger” Moody, that Saturday in May of 1964. Jim has stated that he somehow had made friends with racing veteran and Oswego supermod driver Eddie Bellinger. Bellinger took a special interest in the sportsman Hoyt was building, and he helped Hoyt to build it. The setup was meant for pavement, but it ended up working beautifully on the Fonda dirt. It makes one think of the Rosner – built Czepiel #888 pavement car with which Rene Charland tore up Fonda a few years later, thus changing Fonda cars forever. Eddie Bellinger, Sr. and Eddie, Jr. Although the feature went flag – to flag with out a mishap, accidents marred the qualifying heats. Jim Hoyt of Saranac Lake and Ollie Palmer of Elsmere were taken to St. Mary’s Hospital, Amsterdam as a result of crackups. Hoyt received four broken ribs when his car struck the third turn barrier after being struck by Jerry Townley’s flipping vehicle. Townley was unhurt in the second heat mishap. time to test it out. Below - Jollie Ollie Palmer and his dumped ride, Bill Fowler’s 27Jr. The Hoyt car came catapulting down the track in front of the horrified grandstands. The jackass that always sat in front of us and made wisecracks was silent, mouth open in horror. The car was in about three parts, with track officials sifting through the remains of the driver’s compartment to get Jim out. On other areas of the wreck’s path, the engine and the drive train were lying in separate spots. Keep in mind that others were pouring out from the infield to see to Townley, as well. Apparently Townley’s Tom Chewins #108 was none the worse for wear, as he would come to our local fair at Rutland, VT in September and run roughshod over the less powerful local cars. A modified partly owned by Jim Hoyt and driven by Matt Woodruff has the Hoyt traditional #55 NY. The Hoyt crash left Jim with back and rib injuries, some of the ribs doing internal damage. His family ran Saranac Lake Speedway, and he would be seen at the track, unable to drive, his body carrying drainage tubes for months. Jim once climbed Moody’s #63 sportsman and did some hot laps. That night, his family stood on the track with locked hands, forcing him to stop risking re-injury. But he was never to race again until 2006, when he tried a few races in a dirt modified on pavement at Airborne Speedway. Palmer suffered a sprained ankle when he and Lennie Holmes of Cobleskill tangled on the first turn in the third heat. Palmer stayed in the hospital overnight. Palmer, ironically, had flipped his own car, the #JO, in almost the precise spot on the Fonda track, eight years before. According to the Fonda book, while he was convalescing from the crash, he was visited by both his wife and his boss, both promising termination of relations if he did not stop racing. 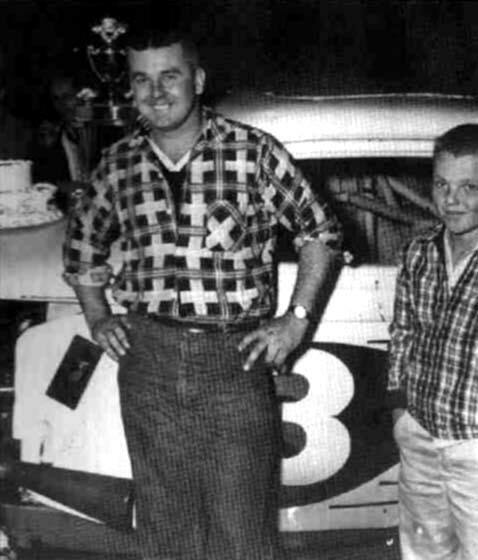 The Fowler team, which [like Ollie] went back to the old Pine Bowl racing days of the 1950’s, would now go through a series of drivers including Terrible Tom Kotary, brother Robbie Kotary, Jerry Pennock, and Ken Shoemaker before ceasing operations in the 1970’s. in the 1950’s, at places like The Pine Bowl. Heat winners were Skip Roots, Gloversville; Ken Shoemaker, Schenectady; and Ed Ortiz, Ransomville. Irv Taylor of Crescent drove his Chevy – powered 1960 Falcon to victory in the consolation.